We will visit Kaminaljuyu "Cerro de los Muertos" this was open in the 1970s, it is the only relatively large site that has been protected from accelerated urban growth. In the two sections of the park have been roofed areas exposed by archaeologists, where visitors can appreciate original pre-Hispanic buildings. The Kaminal Juyú Site was the most important pre-Hispanic regional capital of the Guatemalan central highlands. Then we will see the Miraflores Museum collection that consists of around 500 pieces from Kaminaljuyú, which were obtained in the excavations of the Miraflores Project, between 1994 and 1996. Also has a recreation of a Mayan burial, whose remains date back to 1,500 years ago, a jade mask made of shell, obsidian and 1,300-year-old jade mosaics within a tunnel which aims to preserve the cultural heritage and give the visitor the opportunity to discover the richness of the Mayan culture. After the pick up time we will move to archaeological site Kaminal Juyú to see the park and the ruins. When we finish we will take a transportation to Miraflores Museum to see the collection and the tunnel inside of the museum, the guide will explain about the importance and the history about the places that we visit. 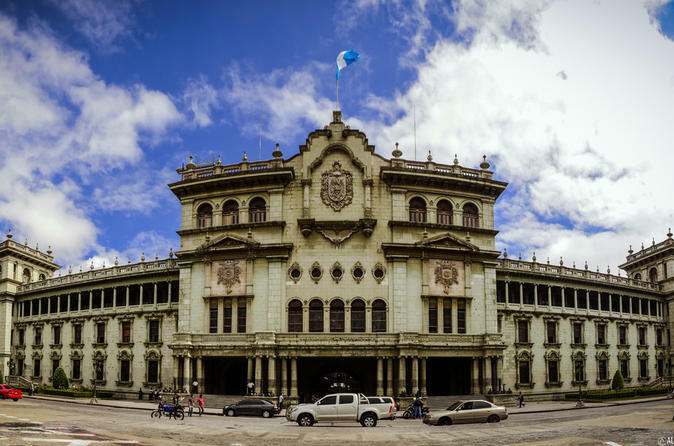 At the end the visitors will have a panoramic tour in a Plaza Central of Guatemala City and you will see the National Palace and the Cathedral of Guatemala.When the guide end you will take a transport to your lodging. Please take note the Tickets are included to Kaminal Juyú and Miraflores Museum.